During my first trip to Marukai I bought this $1.49 bento box in a horrid orange color with 3 weird monkeys on the cover and the words, “Do you like living here? Yes I like it a lot”. I have no idea what possessed me to buy it or why I bought 3 thinking I could sell them on eBay. Maybe the $1.49 price tag just fried my brain and from then on I was doomed. Anyway, that’s the box I used today. The really creepy cover aside, it’s a great size bento box! 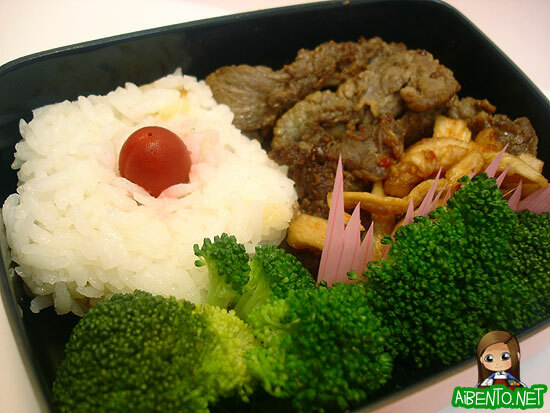 We ate some very yummy teriyaki beef last night so I had to take some for lunch. I used one of my many onigiri molds to make a flower shaped musubi with an ume in the middle. Unfortunately the beef had touched the rice on the way home so some of it was brown. My poor flower has wilt! The ume also stained some of the flower because I wasn’t careful as I pressed it in. These little umes are a little different from the bigger, wrinkly looking ones but they’re definitely cuter. They seem crazy expensive too, like $5.00 for a small container of maybe 40 plums. I try to look at it as 40 bentos worth of ume and that makes it seem not too bad. As you can see, I put in broccoli and daikon kim chee for veggies. I also packed my crab avocado salad and two white peaches, but you already know what that must look like, lol!